Beautiful Oceanfront Villa in Hali'I Kai- Unit 15c tax id # W68657693-01. Aloha! Please take a look at our wonderful oceanfront villa in the Waikoloa Beach Resort on the Big Island of Hawaii. With the view of the spectacular Kohala Coast greeting you when you first open the door and the beautiful island decor you may never want to leave! 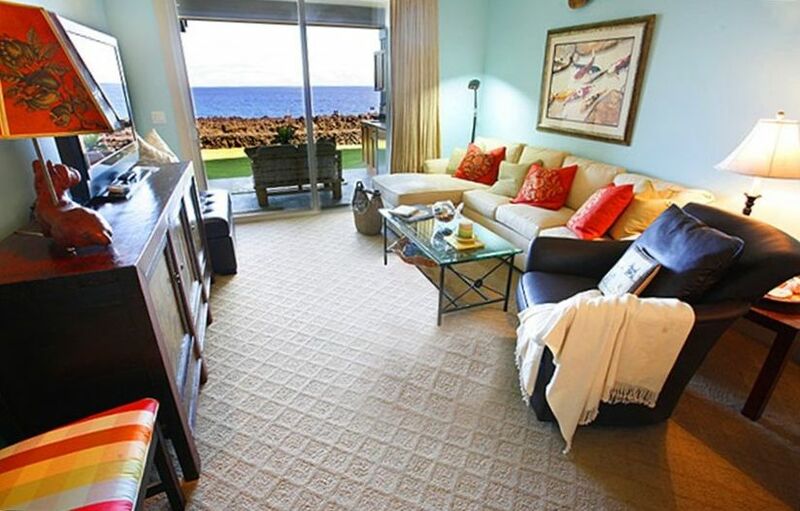 Location: Our villa is one of the few Hali'i Kai units that is an oceanfront ground floor unit- we are unit 15C. This allows you to open the sliding glass door and walk right out to the lush green grass. The sound of the waves splashing on the lava rocks will relax you instantly. Villa interior: This new two bedroom is our home away from home and the comfortable decor reflects that. This is old world Hawaii meets modern day comfort. Our home has the perfect living room featuring a large LCD television with DVD player, i-pod docking station, and surround sound. The dining table seats 6 and the gourmet kitchen is equipped with all of the culinary essentials; including granite counters. Off the living room the spacious lanai has a sofa and table ( there is a hibachi grill to use as well). Each bedroom has its own full bath and LCD TV; there is a DVD player in the 2nd bedroom. The spacious master bathroom has granite counters and large walk-in shower. The master bedroom has a comfortable king size bed. The 2nd bedroom has a queen size bed. There is also a twin pull-out available. For your convenience there is a laundry room with a full size washer and dryer. We offer a full supply of bath and beach towels, bed linens, hair dryer, laundry supplies, coffee maker, and wireless internet access. We also have fabulous, reliable assistance offered if needed- it is just a phone call away. Amenities- you are literally steps from the Hali'i Kai Ocean Club, which is a fantastic oceanfront clubhouse featuring the spectacular ocean views, large multi-level swimming pool, heated sandy bottom lava rock spa, aqua loungers and a children's pool that is 1 foot deep. This is the place you can enjoy the luxurious amenities of a first rate resort with a poolside restaurant and bar. There are outdoor covered dining and lounge areas, spa towels, and an oceanside exercise cabana with stairmaster, weights and elliptical machine. At the Ocean Club there is access to Hali'i Kai's concierge service; as well as an outdoor BBQ area. The Ocean Club is the perfect place to unwind. There is a $10 a day resort fee (As of January 1, 2018 the fee will be $20 a day), which cannot exceed a $300 total (as of January 1, 2018 this will not exceed $500 total) and is paid to Hali'i Kai directly (not part of your reservation for 15C). Local Area and Attractions- One of the wonderful things about Hali'i Kai is that during the whale season you can easily see the Humpback whales playing in the sea. From the villa or the Ocean Club you can take an easy scenic five minute stroll on the 'Trail by the Sea' to the Hilton Waikoloa Village. There you will find restaurants, the Kohala Spa and the Dolphin Quest Lagoon. Our villa is perfect for your next family vacation, romantic honeymoon, or for a relaxing getaway. You can enjoy all the amenities right in Hali'i Kai or go to the local areas; such as the King's shops which features a Roy's restaurant. There is also Queen's Marketplace, 2 world class spa's, luau shows, and a gourmet marketplace at the Mauna Lani mall. The land of the Big Island offers so much from its natural beauty. You can visit the volcano, waterfalls, turtles (honu), horseback riding, snorkeling, fishing, and so many lookout points and parks. Hali'i Kai is the perfect destination to set your bags down, relax, and enjoy the island. We look forward to sharing our home and that you will enjoy the Hali'i Kai experience so much you will want to join us again. There is a workout area and grill for Hali'i Kai guests at the pool area. There is an Ocean Club at the pool that serves lunch and beverages. This was a fantastic location. Great access to beaches and the rest of the island for adventures. The grounds are meticulously maintained. Property owner made it idiot proof for access. This an amazing location. We saw so many whales while sitting on the backyard patio. It is a very short walk to the pool club which is quite scenic overlooking the ocean, and we ate dinner there our first night. The house is very comfortable and close to all of the local amenities, such as 2 golf courses, beach, and the shops. Thank you for putting your lovely home on VRBO for everyone to enjoy. Thank you so much for the kind words and I’m so happy you enjoyed your stay. Great location with beach view, whale watching every day, nice pool and golf courses. The villa is very clean and supplied well. Grocery store not far away. Quiet area beautifully landscaped. We are so happy you enjoyed your stay on the Big Island. This is a beautifully appointed and decorated property in a beautiful setting. You will not regret staying here. The pool club is a tremendous benefit and the location is excellent. I must warn visitors to the Big Island that we wound up stranded without a rental car for part of our stay due to rampant overbooking and underdelivering during the winter holiday high season. Luckily we could walk across the adjacent oceanfront golf course to the gorgeous Waikoloa Hilton and catch a trolley (only 4 stops for $2/$1) to the fantastic A-Bay beach in front of the Marriott. The unit owner, Sari, was responsive and tried to work with us to minimize the minor inconvenience of a cable repair. We are thankful for a lovely stay. The condo was exactly as described. The furnishings and finishes are very nice and the condo is equipped with everything you need. We did not eat in at all, but you easily could with the well stocked kitchen. This location was perfect for our Big Island outings. The view is amazing, and the short walk to the pool was great. A very nice condo and complex. We loved our stay at Hali'i Kai. The 2 bedroom, 2 bath unit was in great condition, and the carpet in the pics has been replaced with beautiful hardwood, which made the unit even more stunning. The view from the patio was superb, and the kitchen had all the amenities for home-cooked meals. We had a maintenance issue when we arrived that was remedied swiftly the next day, and everyone made sure we were well-taken care of. The community itself is wonderful, with thorough welcome instructions, and the pool is very close by and lovely. We ate at the grill one night, and the happy hour drinks are very reasonable. and the food was delicious. The servers are so friendly as well. Overall, we loved it and hope to return! Thank you, Jessica, for the kind review. We are so happy you enjoyed your stay and look forward to you returning.